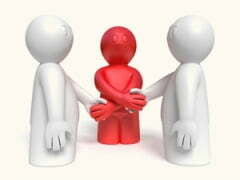 Mediation is the bringing together of parties who are in conflict and a mediator in order to hold a conversation. Parties agree to do so in part because a mediator promises to support them in making their own decisions regarding how the conflict in question may or may not be resolved. In theory, mediators act impartially and non-judgmentally, and refrain from proposing solutions. Because of this, mediators often claim to be neutral, and it is often assumed that if mediators presented themselves as anything other than 'neutral interveners', then the conflict parties would tend not to agree to enter mediation. However, there is much evidence that mediators cannot be neutral. Leonard Riskin, an American academic and mediator, suggests that mediators operate across a spectrum of influence: a mediator at one end of the spectrum directs parties to a resolution of a limited set of issues; a mediator at the opposite end is less intrusive, embracing a wide range of issues and relational matters. Unavoidably, all mediators make utterances with varying levels of intrusiveness, and more directive approaches may be appropriate in some situations, such as commercial disputes or in warfare. However, the majority of mediation work is premised on the idea of mitigating mediator influence to the greatest extent possible. Explorative mediation aims to reduce mediator influence by encouraging conflict parties to explore the conflict and their part in it. An explorative mediator does not seek to manage the parties' conversation, but instead seeks to follow it and encourage dialogue. There is a general aim to understand both parties without prejudice, and to try not to influence either party. The explorative mediator strives for selflessness by attempting to become absorbed in the parties' stories and focusing on moment-to-moment exploration of the conflict, resisting the urge to 'manage' a resolution to the conflict. Paradoxically, part of this process involves maintaining an awareness of the social and political context of the conflict. The mediator's disposition may be expressed as an attempt to engage selflessly. This apparent oxymoron captures a dynamic conundrum that may find momentary and partial resolution if the mediator is able to remain open-minded and undecided about issues that arise from the dialogue. By doing this, and striving to minimise mediator influence (or at least make any instances of intrusion transparent), it is hoped that the parties benefit from a space where they can collectively discover truths that might otherwise be hard to access. Goffman's concept of face looks at the 'positive social value' that we attempt to maintain during social interaction. This positive social value involves our feelings of self-worth, which are attached to our notion of 'who we are' in a particular social interaction. For example, an academic's face while giving a lecture may be related to their status as an academic and expert: if they forget an important aspect of a theory in front of students, then they will experience a loss of face. At home with their family, however, the academic's expertise in a particular subject will not be a major part of their face; instead, their status as a son/daughter, mother/father will play a greater role in their experience of face. We may view our face as consisting of various identities: some are prominent in a given situation, while others may surface subject to discursive events. Face influences our behaviour: what we say is related to our desire to maintain our own face, and our knowledge that others experience face and have their own face needs. It is woven into all social interaction. An important aspect of Goffman's notion of face is the idea that we can attack the face of others: because we know that others have face needs — a desire to have their status respected, and to be liked by others — we can attack these through our words and actions. A heightened sensitivity to face can help mediators to be more attuned to their own needs and feelings and to those of others. The observations below discuss moments in mediations where I can now recognise that face either helped me to work with a situation, or has been significant in learning from a missed opportunity to make an intervention. An awareness of face can be invaluable in the way a mediator approaches challenging situations. During an initial mediation visit my co-mediator and I were challenged by a highly articulate and extremely verbally aggressive party who was unconvinced by the value of a mediation process or our role as mediators. He demanded our opinion regarding the legal correctness of his criticism of his neighbour: "You must have an opinion, and since I am technically right, then you must agree with me." I found myself feeling as though my face was being attacked: it felt as though the individual was being hostile towards me as a person by disparaging my role as a volunteer mediator. Not untypically I was being encouraged to take sides. I responded by explaining our need as mediators to remain impartial, the session continued and I recovered a mediator's equilibrium. However, I felt that my internal response to the party's attack on my face was too personal: while it may not be possible to 'neglect' our own needs in such a context, a keen awareness of face may have allowed me to better hold to my pre-defined role as a mediator. By selflessly seeking to understand his anger I would have dealt more comfortably with the attack on my face. Dealing with antagonism, after all, is an important and routine part of mediation, and so such a consideration of face may allow a mediator to step back and think "I recognise my face is being attacked, but this is not important to me in this role." This incident underscored the difficulty of practising mediator selflessness. Often in mediation, we encounter conflict parties who are intransigent. In our normal day-to-day lives, we might feel free to confront someone who we believe is being deliberately difficult, or at least feel that we have the right to be irritated by them! When in the role of mediator, however, it is important to try to maintain a certain distance from such feelings. Again, an awareness of face can help. It can help us to be aware of our own privileging of certain aspects of face — ordinarily, we might be able to act on our desire for an individual to open up and be less difficult by confronting them, but our task as mediators is to privilege the 'mediator' aspect of our face above that of our 'normal' everyday self. This is clearly necessary to maintain a helpful stance towards the conflict. Only by giving compassionate consideration to a seemingly intransigent party's interests and needs, as well as the background and the context of the conflict, will the mediator be able to understand the conflict party. If the mediator cannot strive for understanding and dialogue then we cannot hope for all parties to attempt to do likewise. In this case I felt my normal face 'intrude' in one part of the conversation but was able to notice this and therefore able to adjust my disposition accordingly. While it is not possible to simply choose not to experience face, we can to some degree be self-aware about how we react to threats towards it, and privilege aspects of our face that are not so 'personal', such as that of 'mediator'. 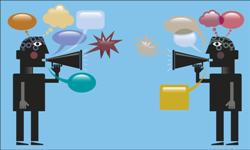 At the end of a long and fraught session between multiple conflict parties, the group as a whole was moving very gradually towards a sympathetic mode of communication. The meeting seemed to be coming to a natural close, with some practical action already having been agreed upon. At this point, one party suddenly launched a very personal attack upon another party. The meeting closed soon afterwards. Perhaps because there had not been a wholly co-operative and considerate dynamic to the session, the group did not take action to recover an equilibrium of respectful communication. With hindsight, as one of the mediators, I might have diverted the meeting to work with this attack and deal with it effectively. However, because my face — and that of others (mediators and conflict parties) — experienced embarrassment and fear, we collectively allowed for the outburst to be ignored. Because we had reached an agreement, we felt it may be too dangerous to address this late outburst. Possibly as a result, the 'agreement' the parties had so far developed broke down shortly following the session. I may have been able to deal with this situation differently if, at this time, I had had a greater awareness of face. Perhaps the more 'personal' aspects of my face and that of others might have been less significant to me, and I would not have felt the embarrassment that I did. Instead, I could have privileged the aspects of face related to our respective roles in dealing with a conflict — mediators and mediation-seekers. As a result, I may have been able to help the group to explore and manage the attack, allowing the parties to deal with this threat to their progress in resolving their conflict. To learn more about face, visit the Face section of the Linguistic Toolbox. Goffman, Erving. 1967. Interaction Ritual: Essays on Face-to-Face Behaviour. Hammondsworth: Penguin, 5-46. Thomas, Jenny. 1995. Meaning in Interaction: An Introduction to Pragmatics. London: Longman. O'Driscoll, Jim. 2011. 'Some Issues with the Concept of Face: When, What, How and How Much?' In Politeness across Cultures, ed. by Francesca Bargiela-Chiappini and Daniel Z. Kadar. Basingstoke: Palgrave Macmillan, 17-41. Riskin, Leonard L. 1996. 'Understanding Mediators' Orientations, Strategies and Techniques: A Grid for the Perplexed.' Harvard Negotiation Law Review 1(7) 7-50.